It says soup, but the concoction in question has a few similarities to a stew, a casserole, a chowder, a bisque or a bouillabaisse. Anyway, it’s a soup I made for the NYE dinner main course at my mother in law’s. Since it turned out rather excellent I feel like sharing. 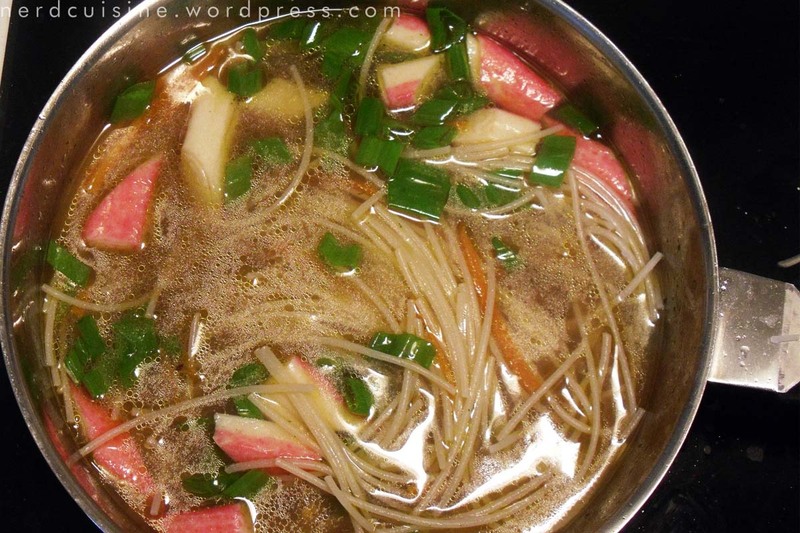 The most important ingredient of all is good stock. 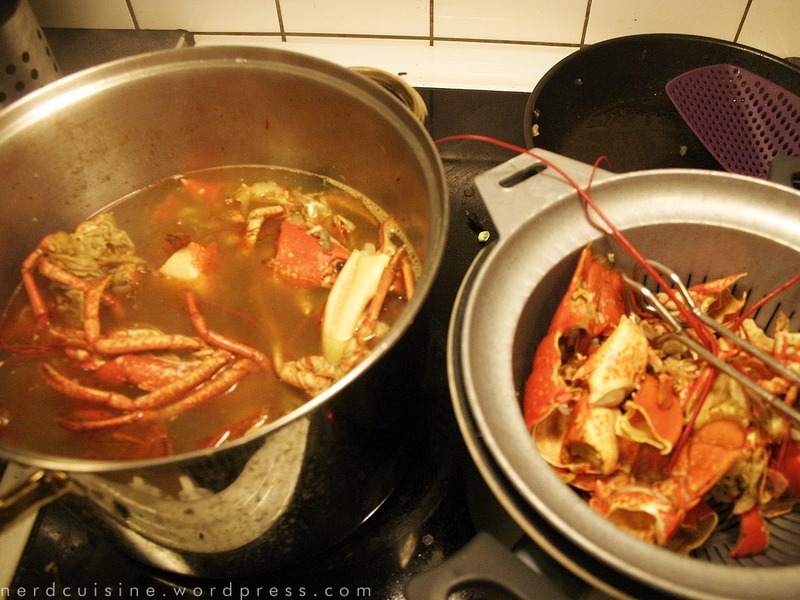 I had two pints of lobster stock that I forgot to blog when I made it, so we’ll deal with that first. 1. Have your mother or similar invite you for a lobster party. 3. 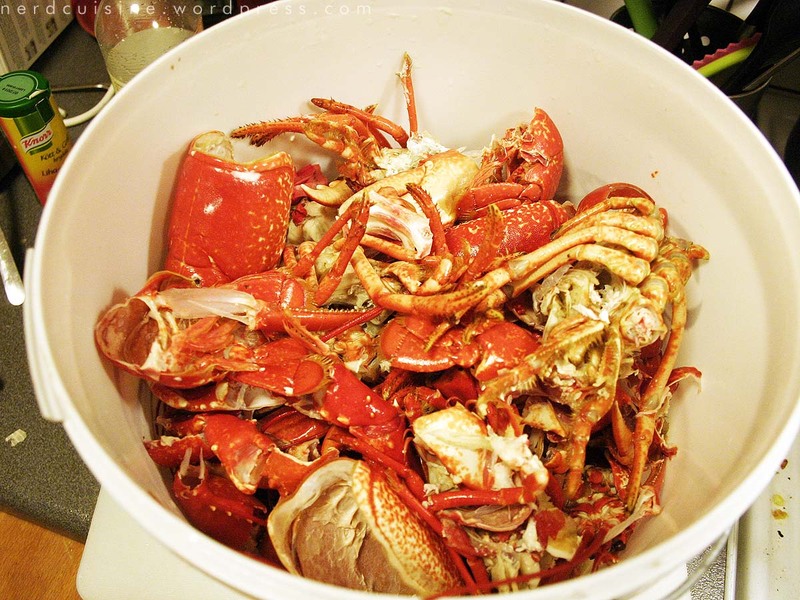 Lug a bucket of lobster peel home. 4. 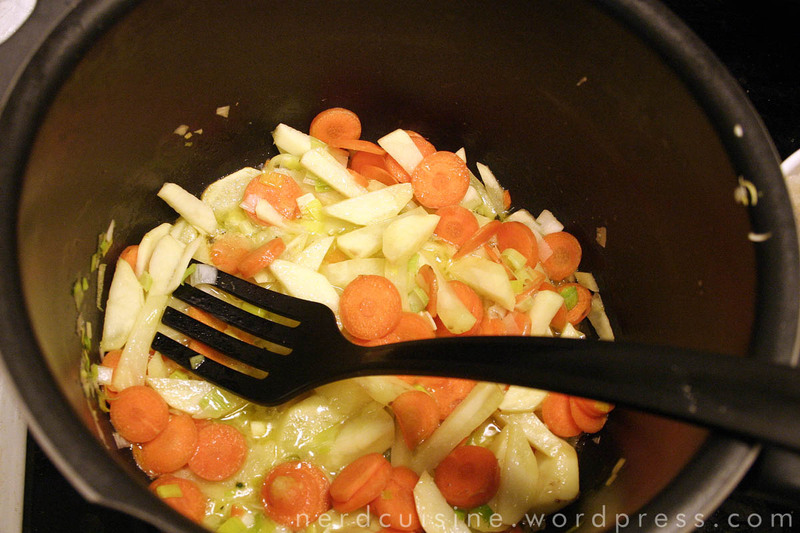 Cut up some good stock vegetables such as onions, carrots, leeks, garlic, parsnips (fennel, celery and celeriac are good too) and give them a sizzle in a large pot. 5. Cram the lobster remains in. Be as violent as you need. (I used a potato masher). 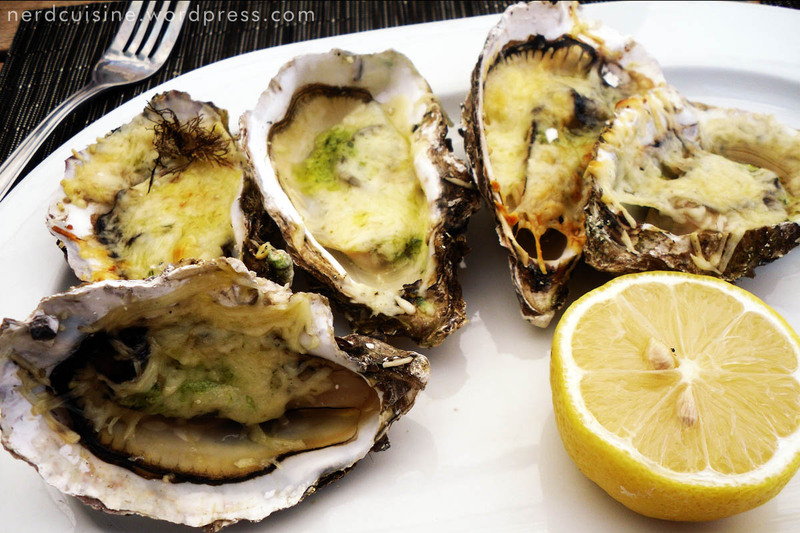 If the shells refuse to be properly seared, oven roasting them first is a good idea. 6. Top up with water, wine and perhaps a bit of sherry. 7. 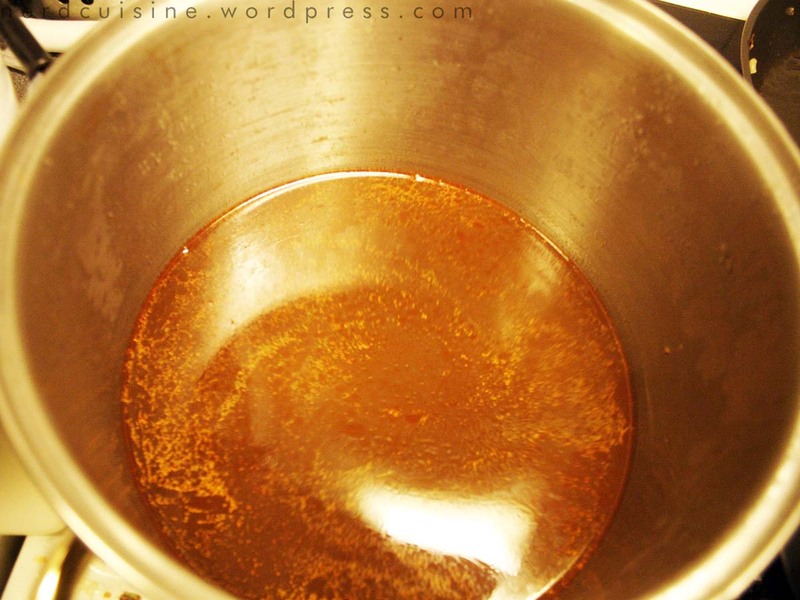 Simmer for as long as you like I’d say, skimming frequently and seasoning to taste. 8. Strain the solids. I ended up using a pillowcase. 10. Use soon or freeze in a suitable container, for example a milk jug. Freezing it in a milk jug will likely mean you end up using all of it in one go rather than a little here and there, since you’d have to defrost it to get anything out (apart from the bit with all the salt in it sloshing around the bottom unless the freezer is very very cold. Since I’m a bit of a cheapskate I didn’t want to use this luxurious stock on just any soup and was at risk of waiting for too long when the opportunity of New Year’s dinner came along just in the nick of time. Also, wanting to defrost the stock well in advance of NYE to see if it was OK I took it out a couple of days early and discovered that we accidentally had turned the freezer off some time around Christmas eve and the temp inside was hovering around zero. Without the stock we’d probably gone for another day or two without checking the freezer, spoiling everything in it. 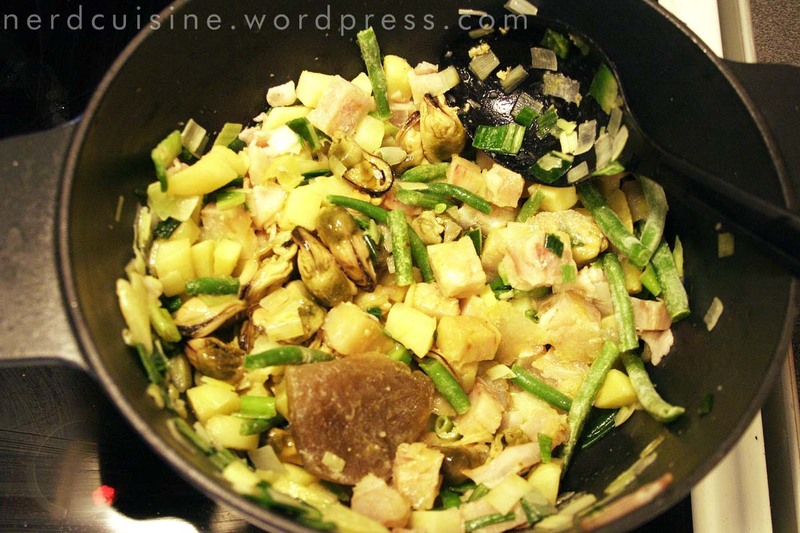 In a pot suitable for soup-making, start by sizzling the tomato paste and onions, then add potatoes and garlic. I left the potato skin on since almond potatoes are very mushy when cooked and will be held together a bit better by the skin. 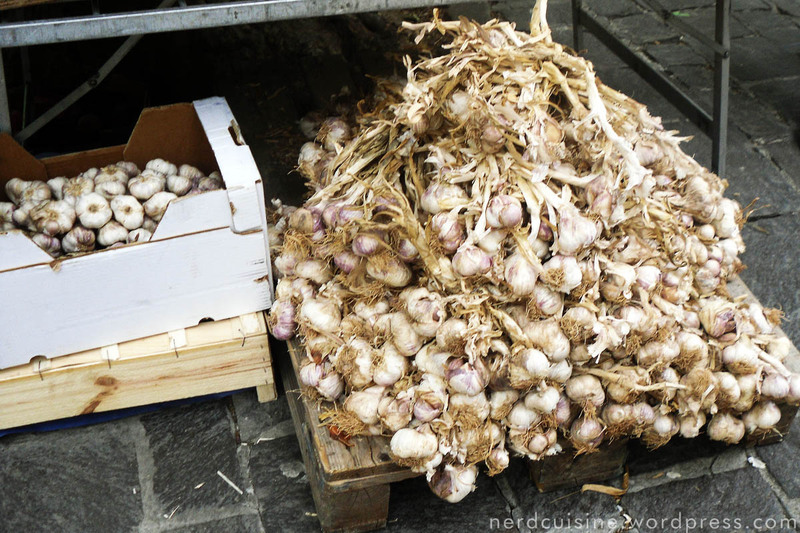 The reason for the comparatively large amount of potatoes is that they absorb salt and the stock was very very salty. Add water as needed. 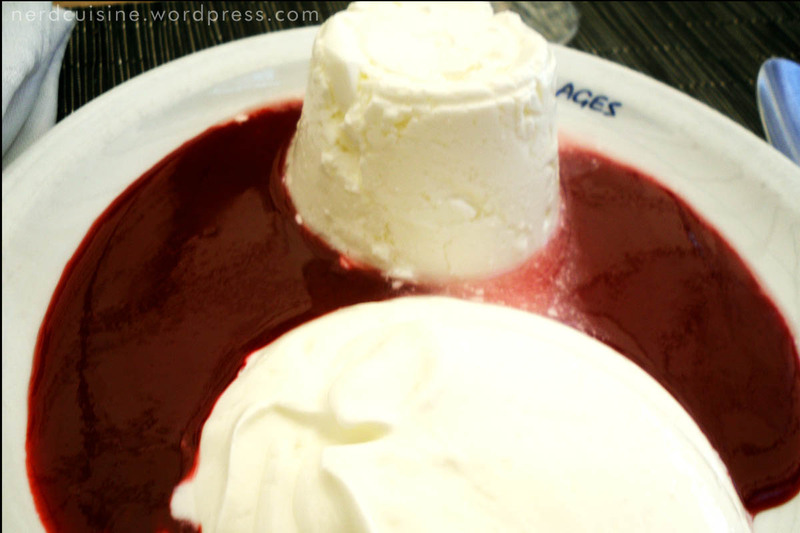 Deglace pot with a small amount of wine, then add the stock and wine to taste. Bring to a boil and cook until potatoes are nearly done, then add leeks, fish, mussels and cream to taste and cook until everything is nice. 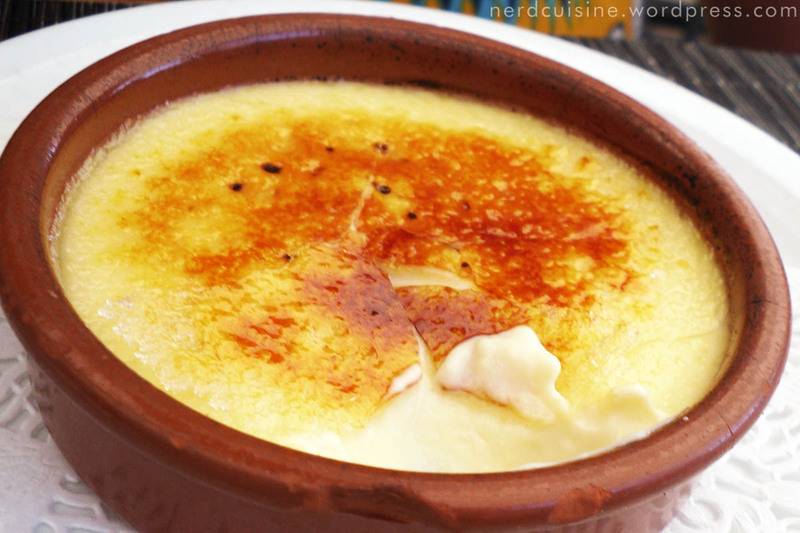 Serve with a dollop of crème fraîche and a few shrimp as garnish. Garlic bread or croutons are nice on the side. The above recipe was cooked up for five adults as main course, but turned out to be enough for seconds for three and thirds for two and also leftovers for lunch for two a few days later, which should add up to 12 servings, but not the largest ones. 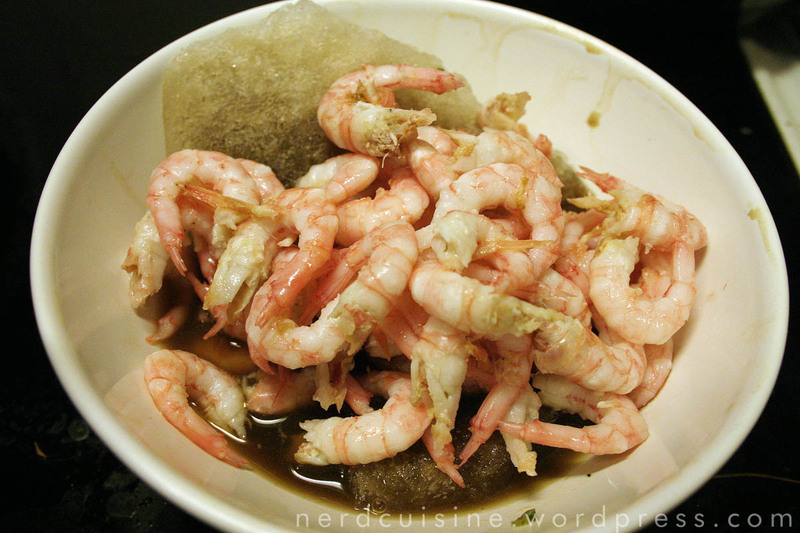 We were invited to a potluck dinner on Easter Monday and my mother had kindly donated a pound of shrimps, which, combined with the shellfish stock made last Easter provided a good base for a most excellent soup. Leeks and carrots to begin with, along with some potatoes to give a bit of body. The haphazardly shelled shrimp keeping the defrosting stock company. 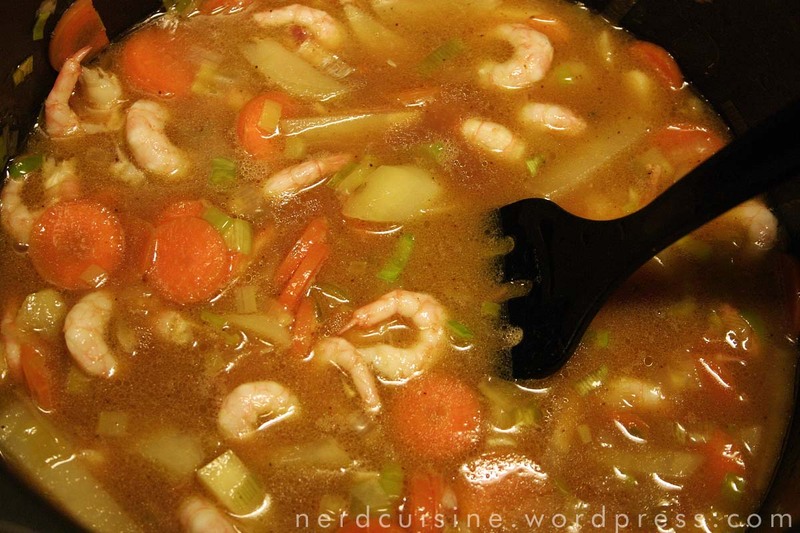 Stock, water, shrimp and seasoning added. 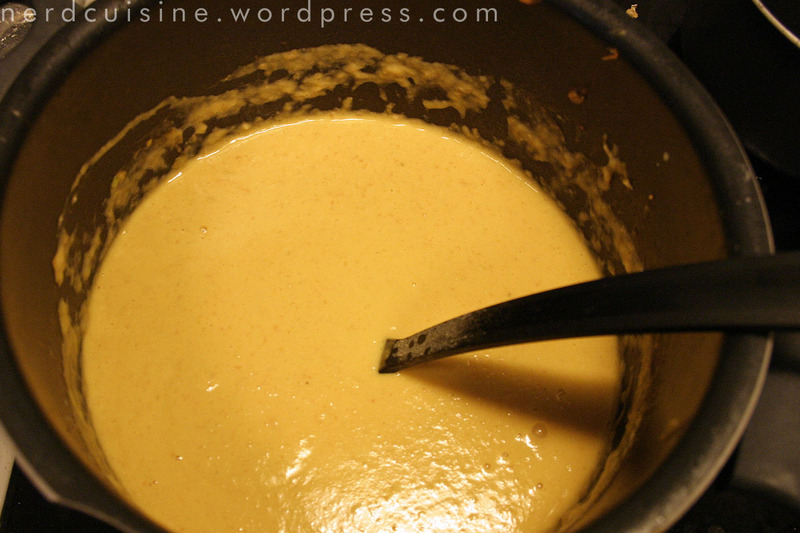 Classic bisque recipes call for brandy and/or sherry, but I don’t keep those in the house. Nothing wrong with a bit of white wine though. Ten minutes of blending and a pint of cream later the soup is done, if a bit on the lumpy side. For a proper bisque the shrimp shells would have been along for the whole ride, but one doesn’t want to attempt a smooth creamy soup with shells and only a hand blender. This has to be the most horrible phone pic I’ve ever voluntarily put on the web. 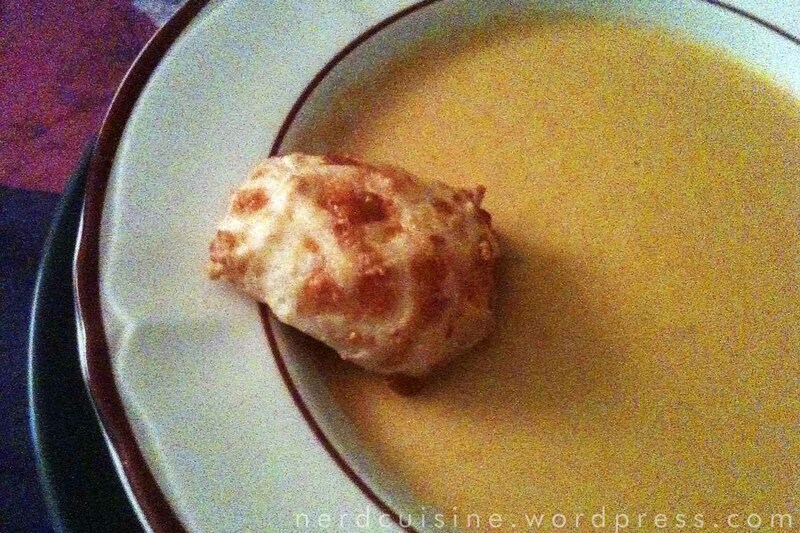 It’s a plate of soup accompanied by a pão de queijo (Brazilian cheese bread) which we also made. 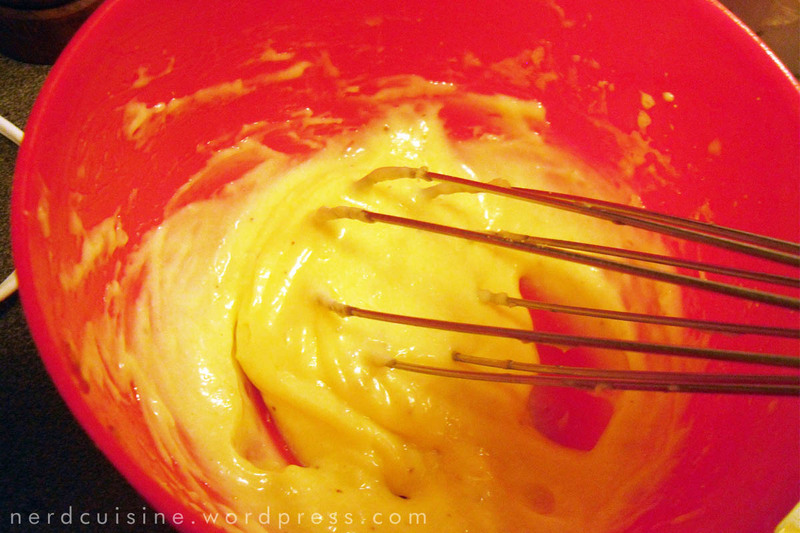 The process mostly involves stirring tapioca starch into liquids and adding cheese, so I’m skipping that part. There are a lot of fine recipes online though, so try it! If you’re in a country where tapioca flour isn’t readily available in most supermarkets (such as Sweden) try the Asian grocery stores. 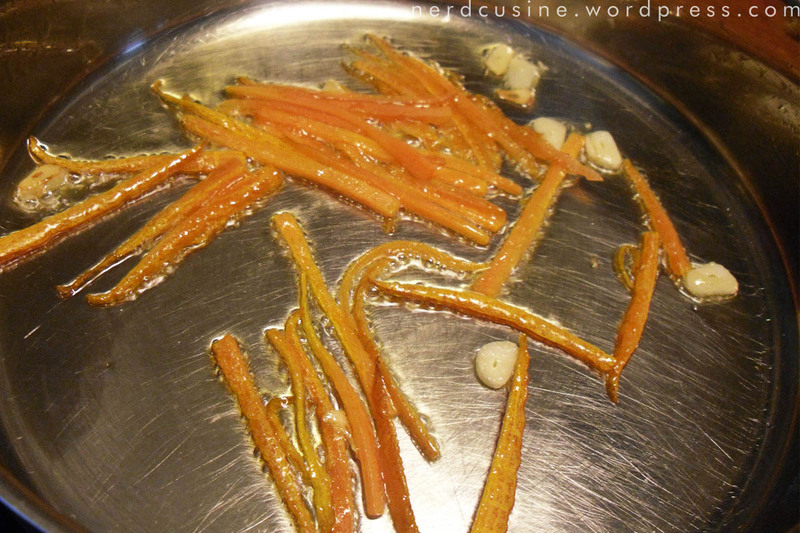 Here’s a really quick and simple pasta dish I had recently and subsequently altered slightly. 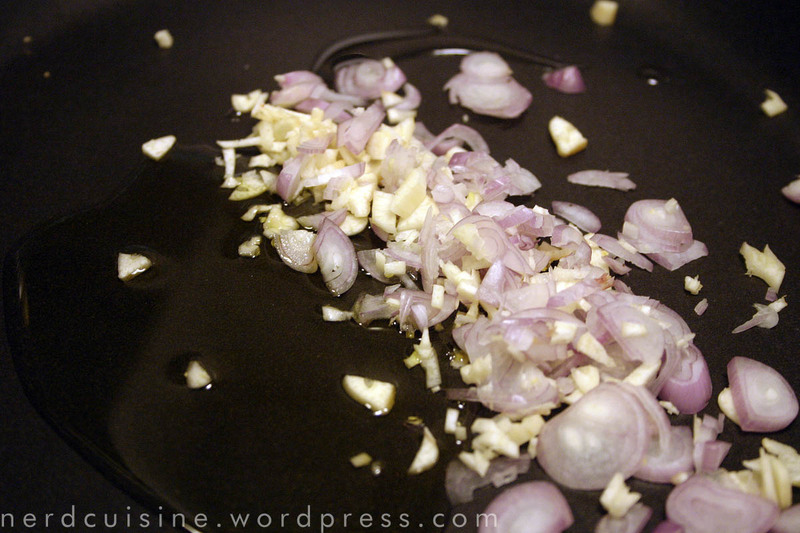 Sauté finely chopped garlic and shallots. 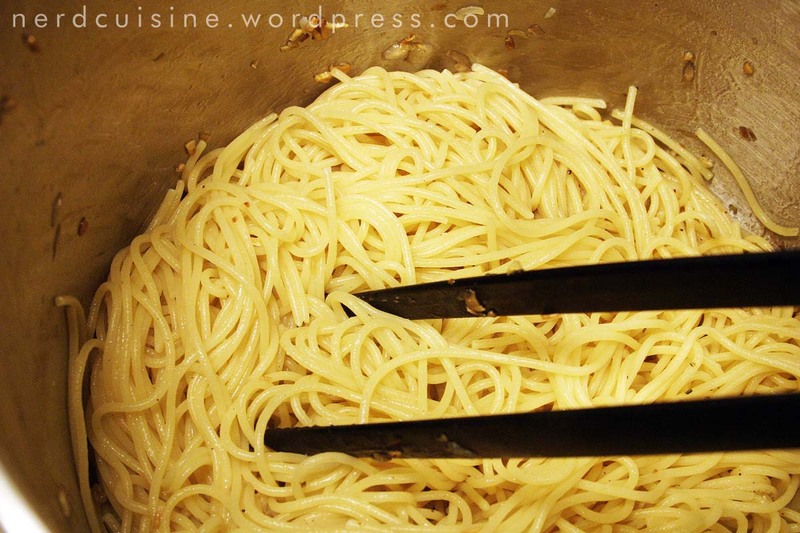 Cook some spaghetti or other pasta of your choice and then give it a quick sizzle together with the garlic and shallots. 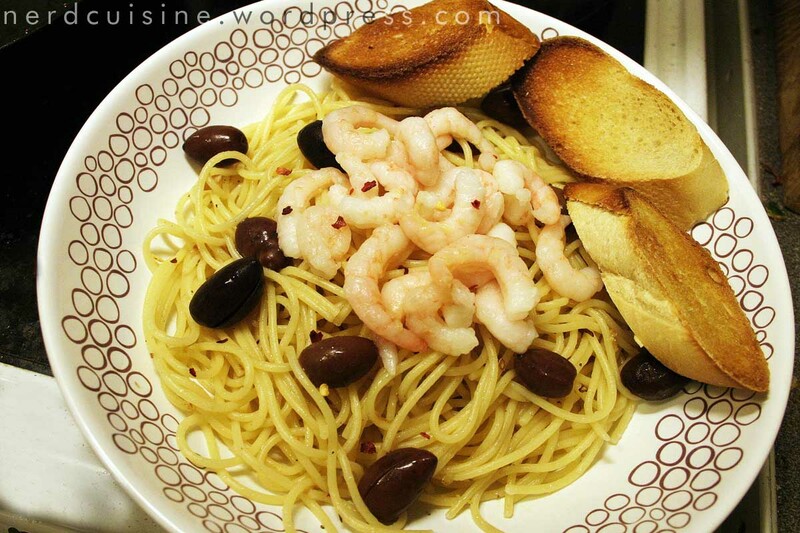 Plate and add shrimp, olives and garlic bread. I also sprinkled a pinch of chili flakes to add some zing. With proper planning, the dish can be done inside the time it takes to bring water to a boil and cook the pasta. I’m thinking that it could be served as a starter just as well as a reasonably elegant lunch or a simple but tasty main course. Then I added slightly parboiled Vietnamese rice noodles, for a break from all the ramen, thawed stock, scallions and bits of frozen surimi stick. 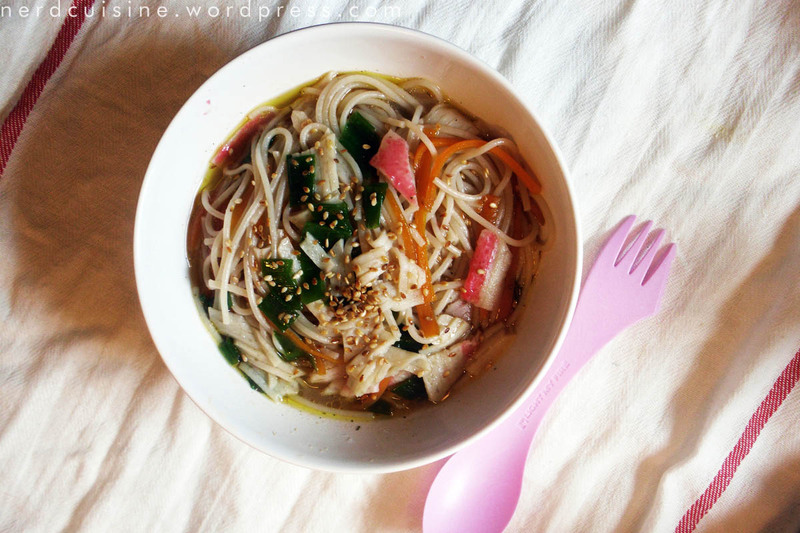 It’s very advisable to defrost the sticks separately and add them at last minute (if you want to use surimi at all, unprocessed fish is probably tastier) since they unfurl when boiled. Put in bowl and sprinkle toasted sesame seeds and other sprinkly stuff in you have any. 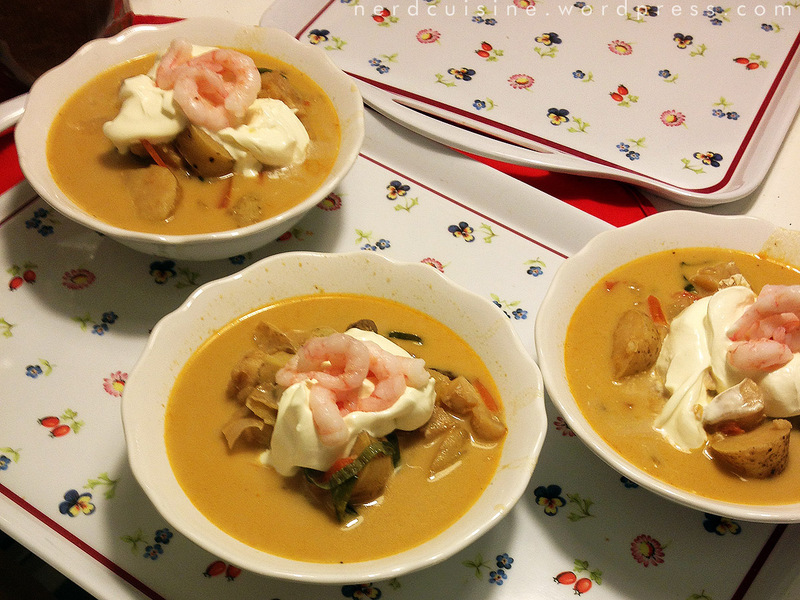 I’d say this dish provided an interesting clash between Asian style ingredients and typical French stock. Hey hey hey! French title! That’s because I spent ten days in France and picked up a word or two. It says ‘mussels with saffron’. 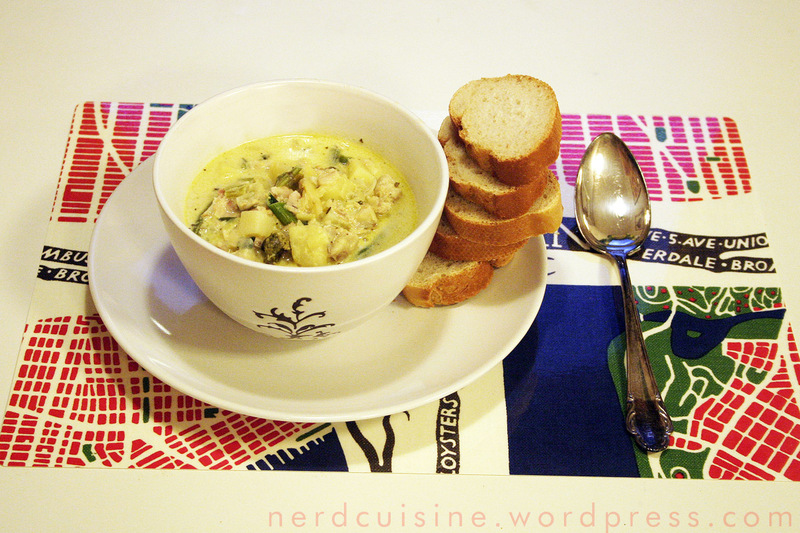 A fairly French (or Provençal) dish. 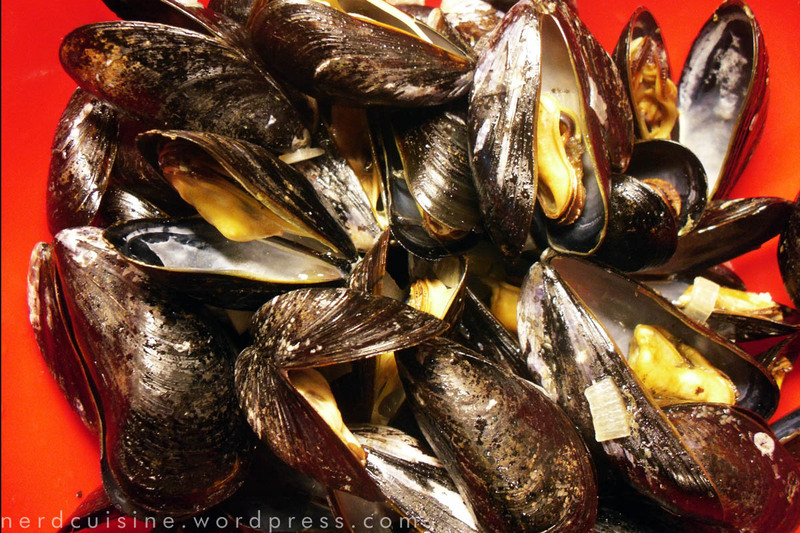 Originally, I had planned on trying razor clams since the grocery store happened to have them, but a combination of economic sense an a failure on the clams’ part to look attractive upon close inspection, steered us towards the trusty old blue mussels instead. 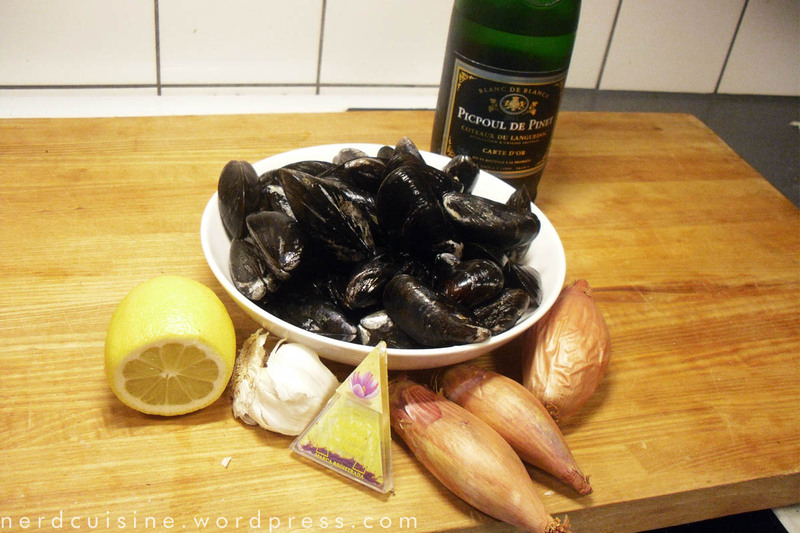 Ingredients for the main component of tonight’s dinner: Blue mussels, white wine, lemon, garlic, saffron, shallots. 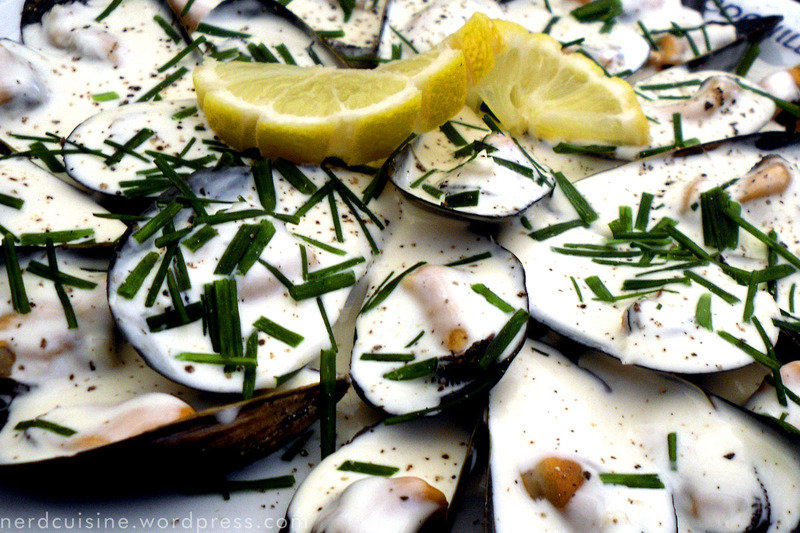 Sweat shallot and garlic in a large pot, then add mussels, then saffron, lemon juice and wine. 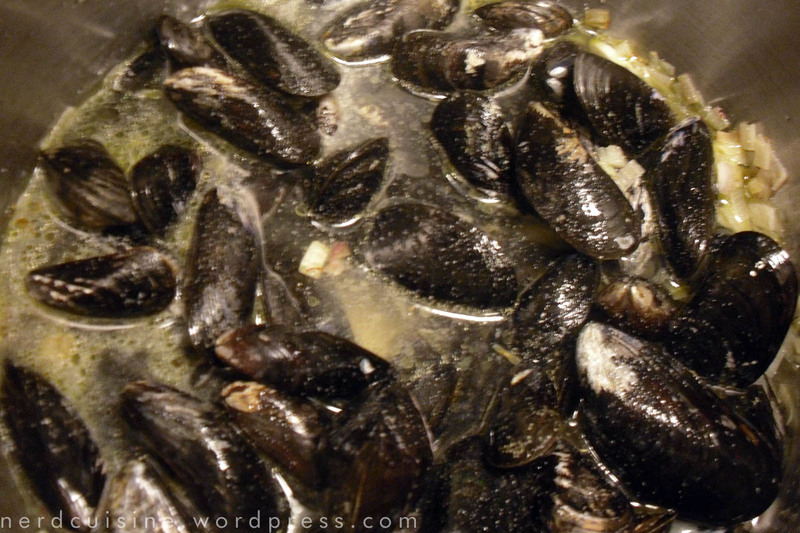 Remove mussels and start reducing the broth. I strained the solids from the broth and then reduced the broth with the sieve partially submerged in it, to get more flavor from the shallots and garlic. 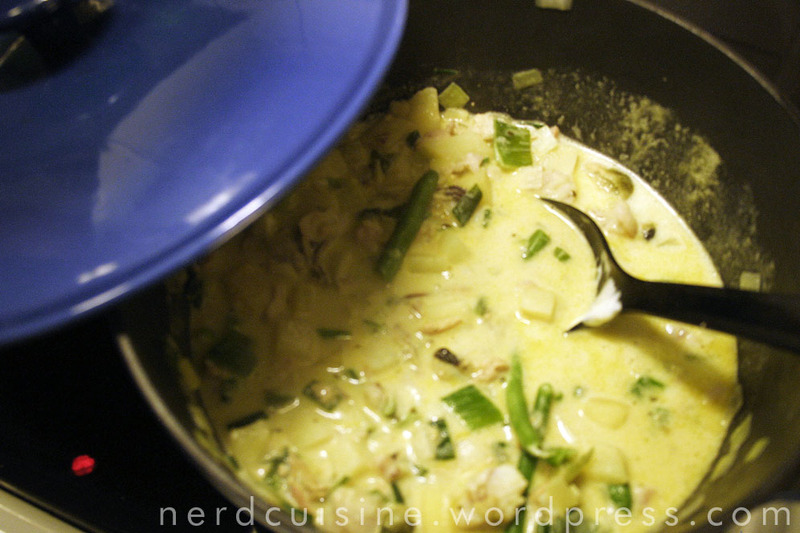 Thicken the broth to sauce using a dairy product or two. I used crème frâiche and Greek yogurt to avoid the worst greasiness that can happen if one’s too generous with for example double cream. 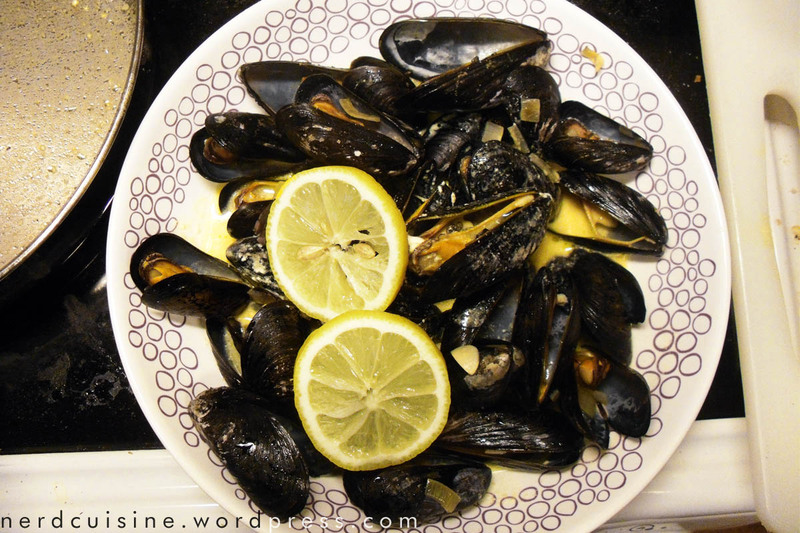 Plate the mussels and drizzle some nice saffron sauce over. We had fries on the side, as in a classic moules frites, but the fries are prefab and therefore not shown. I will, however, gladly show off the bread I baked. 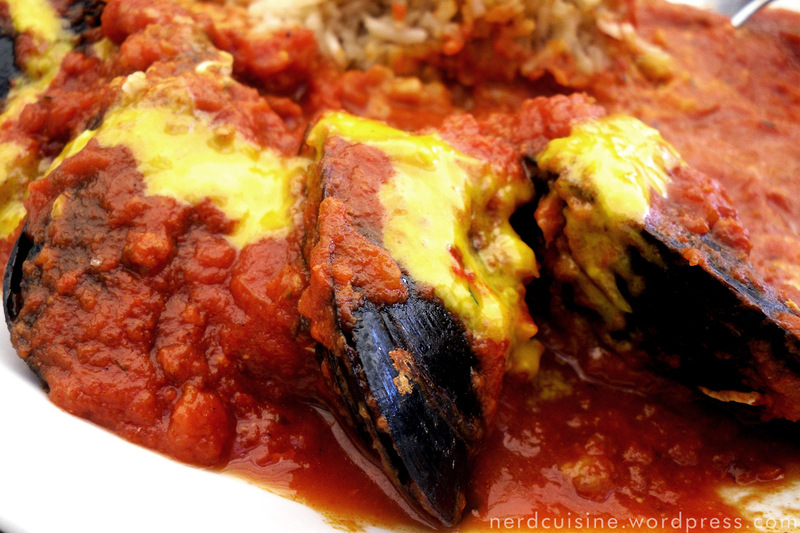 It’s pretty nice to have something to slosh around in the sauce after you’re out of mussels. 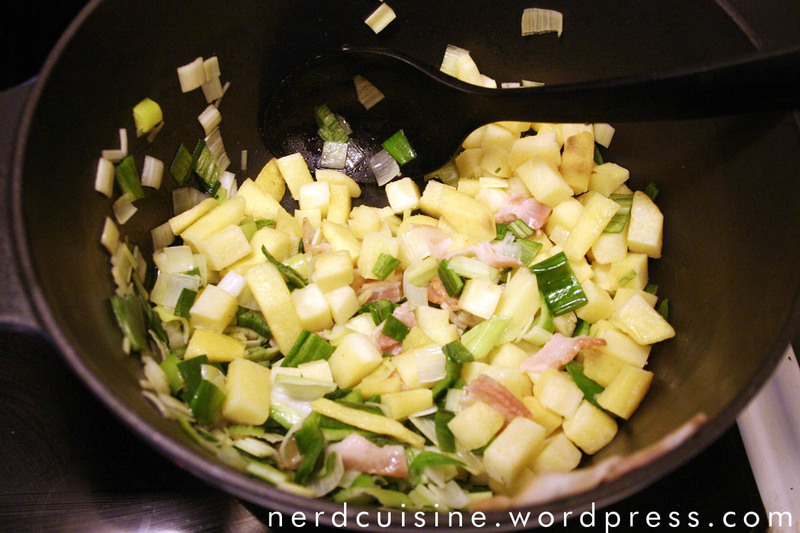 And it’s of course not a proper French dish if there’s no aïoli to add more fat to your fried stuff. 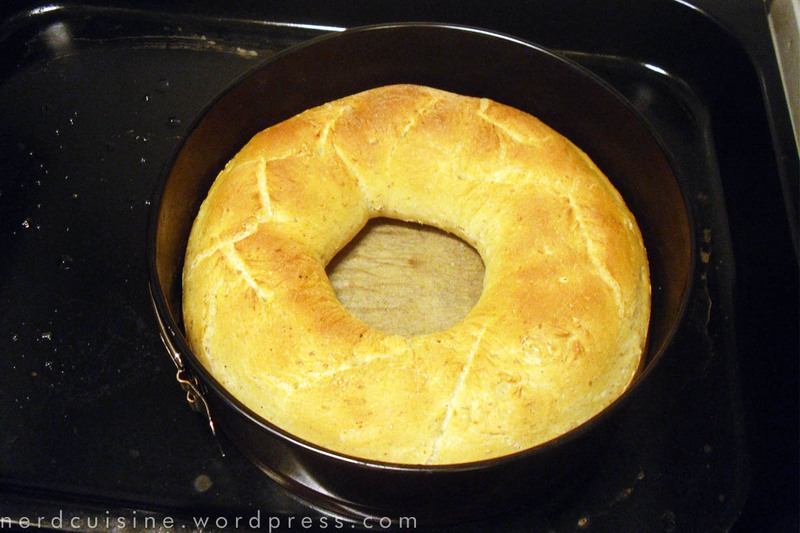 It’s the first aïoli I’ve made (in excellent teamwork with my fiancée) and also probably the best I’ve eaten. The trick is apparently to skip the vinegar and add small amounts of lemon juice and slightly too much salt – which will turn out to be the perfect amount of salt if the fries are underseasoned. To sum up, it was very good eating, but I think I still prefer my mussels cooked by someone else, to save me the trouble of scrubbing and checking for bad ones and so on. I’d happily provide the aïoli though. 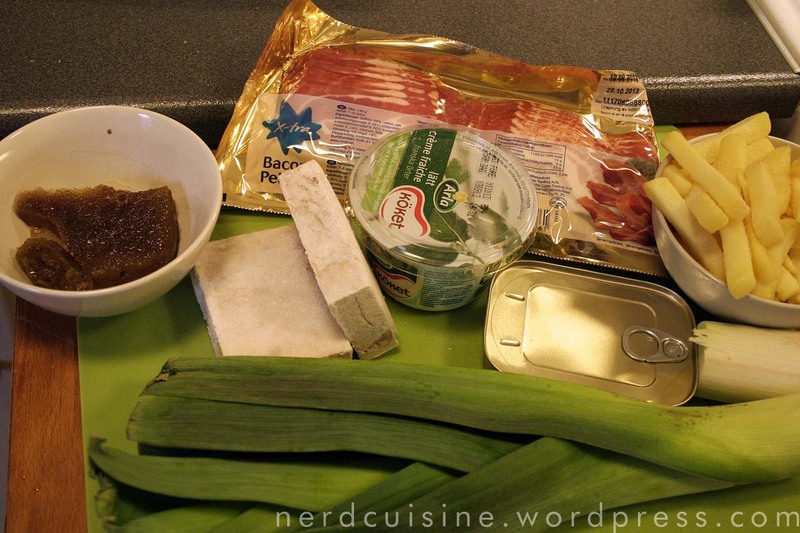 Some may have noticed that NerdCuisine hasn’t updated in about two weeks. The main reason for this is that I’ve spent ten days in France, where I’ve spent more time pointing at stuff in menus than cooking, and gone online almost only for important stuff and only with an iPad. I don’t fancy writing and photographing whole blog posts with an iPad. And now I’m back home, feeling a need to post something, anything, and thinking that the popular type of food blogs other than those with recipes is the kind of blogs where people simply tell their readers what they’ve been eating lately. That’s what I’m going to do now. First of all I must say that I’m impressed with the French food stores that I visited. The sheer difference in selection is humbling. Needless to say, I had a ball every time there was food shopping that needed doing. Even the gas station supermarkets had more stuff than many medium sized grocery stores here in Sweden. I certainly don’t know about any gas stations here that offer foie gras or fresh mushrooms. We spent large parts of the trip in the small village of Blauzac, about 10 miles north of Nîmes, in the region of Languedoc-Roussillon. One of the more obvious features of the house was the fig tree in the courtyard. 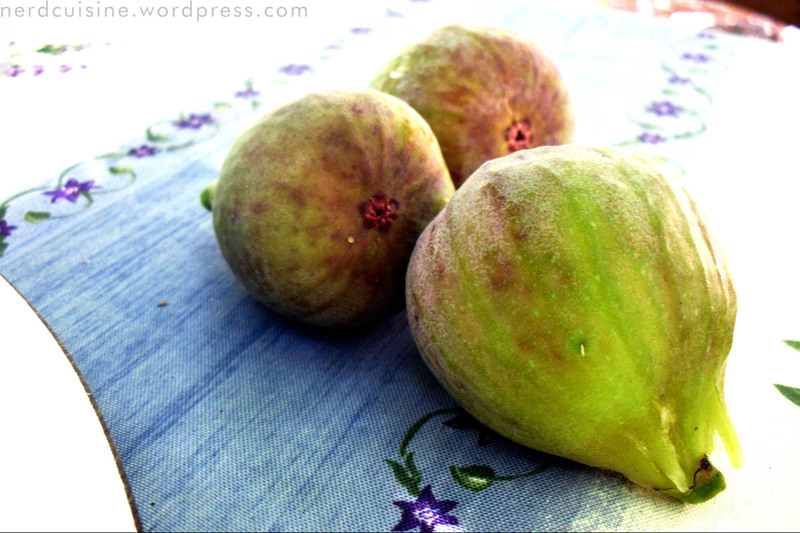 I didn’t encounter a fresh fig until I was 23, and most figs I’ve ever seen in Sweden have seemed to be hours away from rotting and sold at 7-15 SEK each (about 1-2 USD), not to mention the dried ones, which I’ve never liked. Will look into the possibilities of pot-growing a fig tree on the balcony (might be too windy). 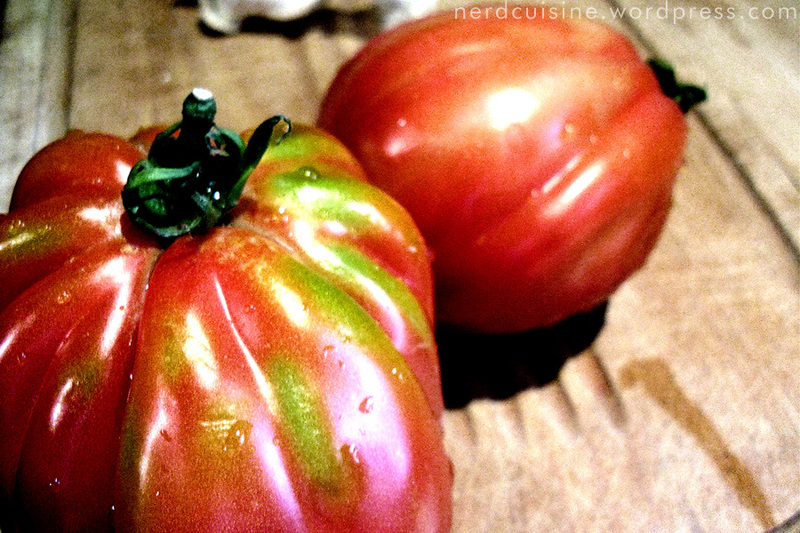 On the second day in France, I fell in love with Coeur de Boeuf tomatoes. I think they’re much more interesting than the more ordinary looking beef tomatoes we usually get in Sweden. 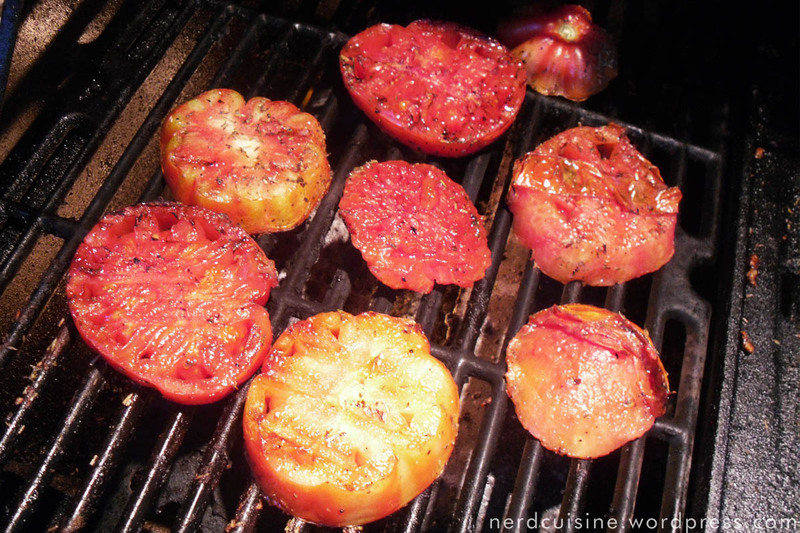 They turned out to be very good for grilling. The next day was Saturday, which seems to mean market day in rural french towns, in our case Uzès, a short distance from Blauzac. The importance of the market is even more apparent when you consider that it was held as usual even though it was also Bastille day and the day when the Tour de France was going to zip through town. Garlic is obviously important. This wasn’t even the largest pile. 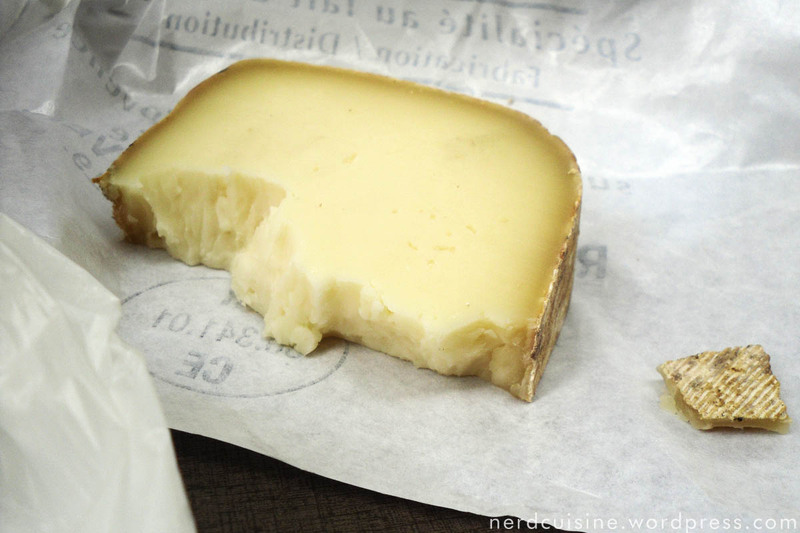 Bought a piece of Gruyère-like cheese at the market to have something to snack on while waiting for the bikes. We had laid siege to a couple of café tables and ordered a steady stream of coffee in order to keep our seats without complaint. 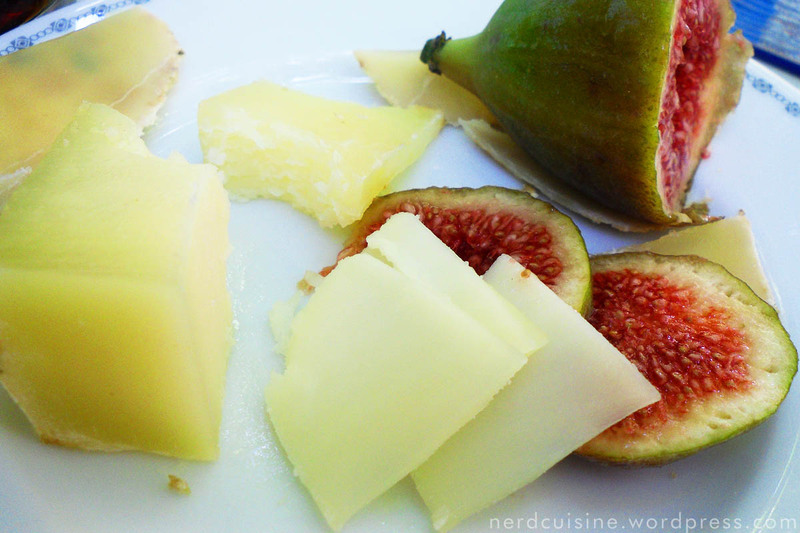 After the spectacle had died down (see, the competing bike riders were harbingered by a continuous flow of more or less fanciful sponsor trucks, making noise and handing out free samples for several hours) I was glad to go home to Blauzac and finish off the cheese along with a fig. This is probably the closest this post will get to a recipe. I was charged with the task of dessert. 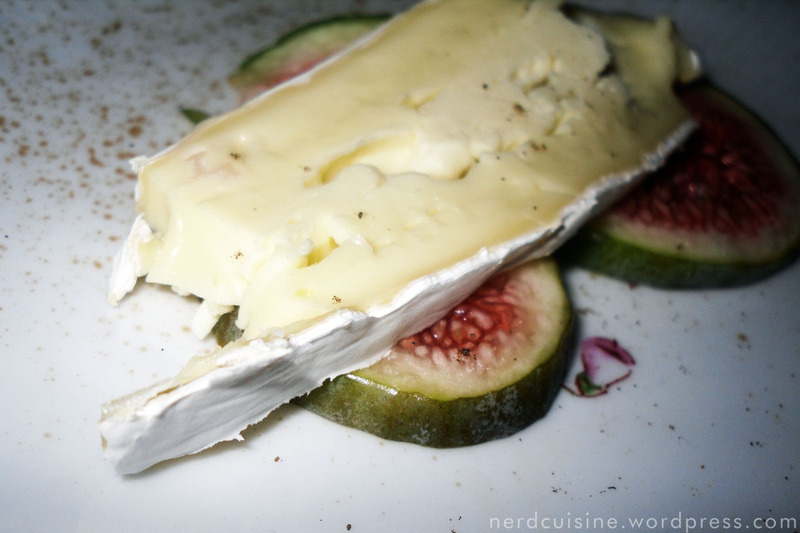 Figs with Brie, black pepper and balsamic vinegar. The vinegar came in a spray bottle. Very convenient. Now I’m skipping a couple of days, not because the food wasn’t interesting, but because I didn’t take any pictures. We headed for the Mediterranean coast to have lunch in Bouzigues, a small town, but very big in the seafood business. Not only did the restaurant we visited know very well how to make sure lots of molluscs hadn’t died in vain. They also were quite good at desserts. After the lunch in Bouzigues, we spent a few days in nearby Balaruc-les-Bains. Apart from an accidentally ordered starter of whelks, the food was good considering that we didn’t pay very much, but it wasn’t mindblowing either. Either way, I didn’t take any pictures since dinner often happens late in the day in France, and I didn’t want to use flash. Having spent four nights in Balaruc, we headed back to Blauzac to settle down a bit before heading home again via Marseille. Cooking dinner at the house there is a collective effort since there’s often a lot of people to feed. We had previously provided a potato salad, grilled tomatoes and a brie and fig dessert but were completely in charge this time. We decided to grill some lovely merguez sausages and serve them with ratatouille and hand cut pommes frites/french fries/chips since the kitchen equipment included a deep fryer. I’ve eaten ratatouille on several occasions, but never made it myself before. It turned out rather nice, partly, I’d like to think, because of coeur de boeuf tomatoes. The camera battery died before I could get a proper photo (which also happened a couple of minutes before the Tour bikes raced past us) so we’ll have to make do with a phone photo. 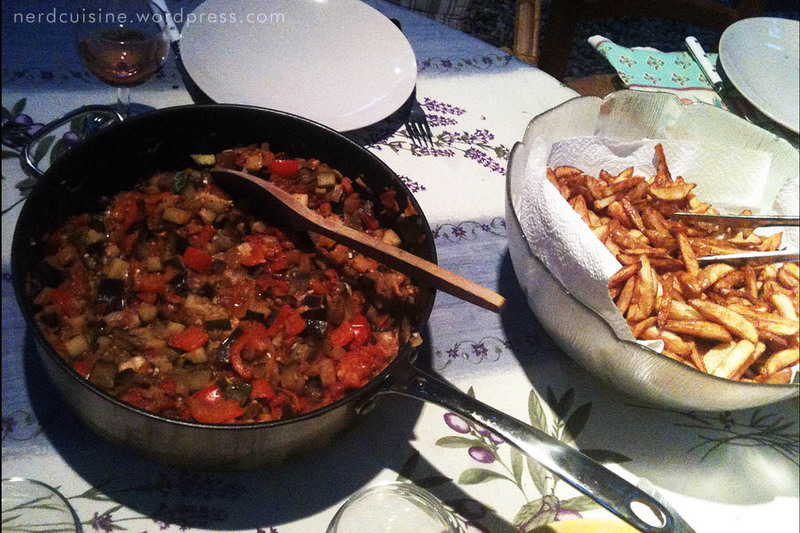 The ratatouille pan and frites bowl looks a bit small in the picture, but they contain food for 12 people. It’s only good and proper to also mention that while at the beach in Sète, near Balaruc-les-Bains, I asked my girlfriend to marry me, which she graciously agreed to do. Now you know, in case this and future posts are unusually silly or chipper.